The Chicago Historical Society possesses one of the finest collections of African American soldier photographs that I've ever seen. 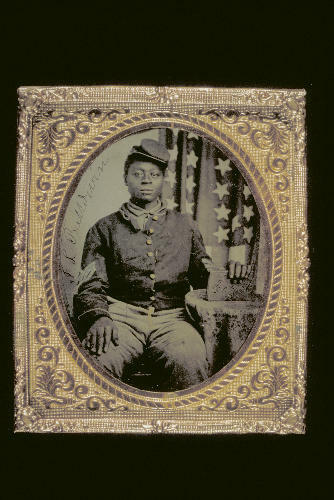 Of these twenty-seven terrific tintypes, one is identified: Sgt. James L. Baldwin of the Fifty-sixth U.S. Colored Infantry. His iconic image, shown here, has appeared in numerous publications. All the published examples of Baldwin's likeness I've found include the briefest of captions. It is for this reason that he will be included in my book. I want to tell his story. I started researching his life and military service yesterday and found that he started the war with the Third Arkansas Infantry (African Descent). Government authorities later designated the regiment as the Fifty-sixth. Baldwin applied for a disability pension in 1889. I look forward to learning more about him, and providing a fresh take on this image by providing details of his war service. If you have any information to share, please comment.